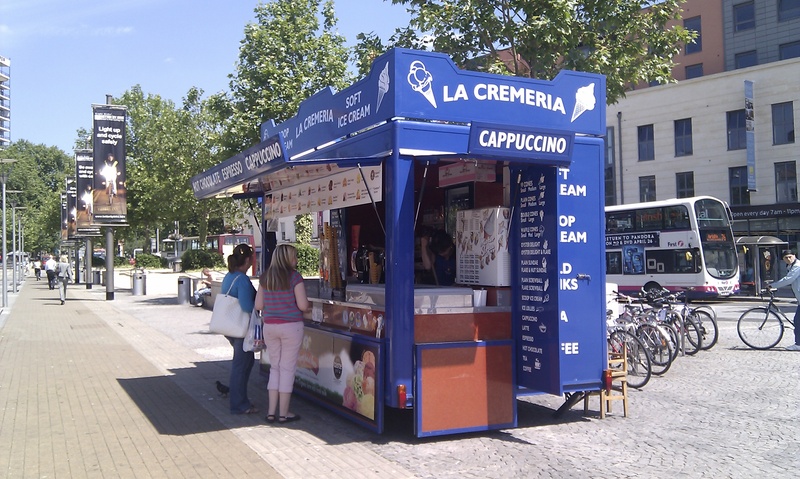 For the five years that I have lived in Bristol the La Cremeria ice cream stand has been parked at Broad Quay opposite the Hippodrome for most hours of the day (Google map). Just by the water, and in between the busy roads of central Bristol, it provides a glimmer of summer holidays that you can access most any time you feel like it. During the week I am constantly tempted to buy an ice cream on the way home but it would have to be before dinner so I usually skip it. Today, on June 21st, I had the day off and thought that an ice cream would be the perfect way to celebrate the beginning of summer. 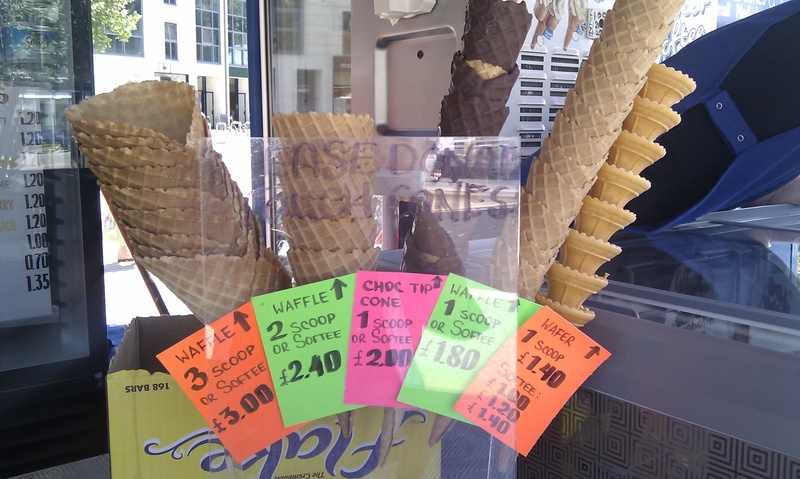 At 12.20, when the Sun moved into the sign of Cancer and summer officially began, I had bought my waffle cone ice cream with one scoop of caramel fudge toffee and the other of banoffee (£2.40). There are 19 flavours available including diabetic and gluten free options. Waffles are not the only cones and two is not the only number of scoops available. 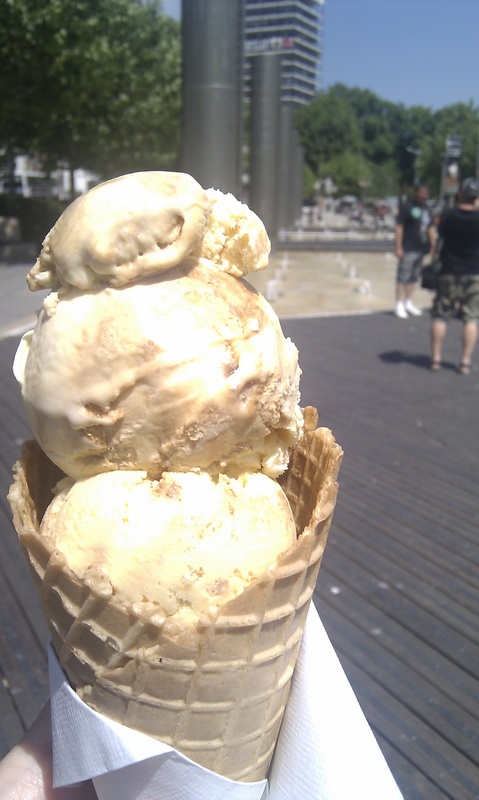 The ice cream was delicious and I ate it by the College Green in the sunshine. I felt a bit like Forrest Gump as a few people sat beside me and then up and left. The only one I talked to however was a guy who asked whether I had bought the ice cream from the van just nearby. I looked up and saw the usual yellow and white vehicle with the typical icy treats. No I assured him, it was from the Harbourside and he agreed that he hadn’t thought so. The ice creams from La Cremeria taste more like a summer holiday than anything else I’ve had in a while. It was delicious. 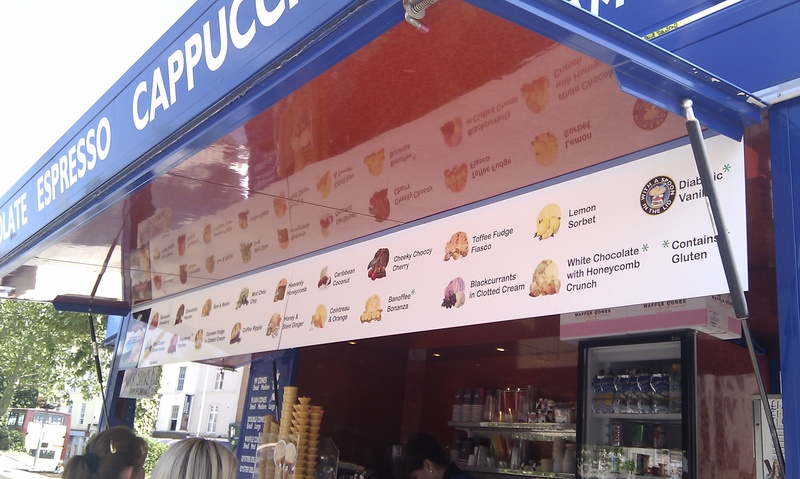 This entry was posted in Bristol, Food and tagged Bristol, Harbourside, ice cream, Ice Cream in Bristol, la cremeria, Summer. Bookmark the permalink. Looks lush – will head down there soon and buy one! Simon, it was. It is. It will be! I always just walk straight past; I’ve considered buying from Lopresti’s van in Anchor Square, but not there. How wrong can you be? Nigel, I would definitely try it if I was you. I love it. I was googling for ice cream places near the harbourside and came across this blog. Your ice cream looked good so I went to see if La Cremeria is still around – it IS and I had the most amazing (if slightly overindulgent) icecream. Thank you for this blog entry – without it I would never have found this place. I’m glad you found it. It really is a lovely place at a perfect location. Thank you for the comment!